It had been part of the long-term planning that I would ride together with Cony on the 4 Island Stage Race for 2018. We were there together last year, had a great race and were looking forward to riding all 4 islands this time. But barely a week before we wanted to go, I had a message from Cony that she wouldn’t be able to ride…. When I read this message on my iPhone, I couldn’t believe what was written and tears came to my eyes. This can’t be true…. After having to retire after a heavy crash on the Tankwa Trek, followed by Angelika’s injury and retirement from the Cape Epic and me finishing as a Lonely Leopard…. 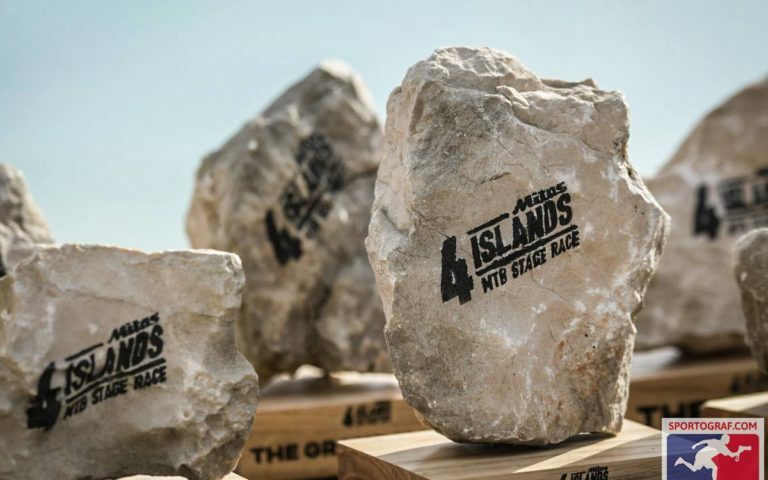 Is the 4 Island Race going to sink without trace before even getting started? I couldn’t and wouldn’t believe this news…. As soon as I had time to concentrate between working on my fitness, I called Cony and it was obvious that something wasn’t right. We talked together, and I tried to convince her that it would be best to come anyway, give it a shot and ride as fast as possible. She promised to give it a go and I just hoped it would be ok. Since Cony wouldn’t be coming to Spillmbergo and the European Championship after the race in Croatia, we took two cars to Omisalj where we would meet the ship. Stage 1. Insel Krk: From Baska to the Moon and Back. Although this year the race was classified as a UCI S1 race, not many women’s teams had signed up. This was a little helpful as we wanted to ride our best but at the same time I had promised not to put too much pressure on Cony. So there we were, and we started with joyful anticipation on Wednesday morning. From last year we knew how things were organised and how they worked. We were able to let ourselves be carried along with the great atmosphere without getting too stressed. Finally, the starting gun…. The two “Ghost Girls“ mashed the pedals and me, as a slow started had to really get a wriggle on. Fortunately, it was soon an up-hill section which is my preference and we were able to take the lead of the women’s field. This however didn’t mean much at this point as we didn’t know the other teams and their form. We decided to ride our race and not get pushed into doing something crazy. We found a good pace and rhythm on the way to the Moon. First, tarmac, the trail snaked in hairpins upwards through the forest. At the top, rough terrain waited for us. The trail wandered through the stony landscape and as the track widened, we made our way across the Moon. The landscape was incredible and made you forget the hardship of the climbing. After a short descent, we climbed again to the highpoint of the Treskavac pass where we were placed feed point. Fed and watered, the final ascent before the trail descended to the valley after Punat, the trail was riding very fast and we were down quickly. Next, really steep and up on a small plateau towards Garica for the second feed. The island helper fed us well and we continued quickly… thank you!!! More trails followed and you had to find your own way amongst the stones, pedalling harder to push over the steps. It was a fun section. We didn’t want to risk too much as a fall or flat would cost us more time than if we rode a little slower with more care…. But obviously, not that slow!!! Vrbnik, the last climb of the day. Mostly a high trail needing concentration if you wanted to ride, or you were pushing. Most of the time I could ride, the trail taking us downhill through bushes and glades. All too quickly we came to a tarmac road through Bascanska and the finish. The last part of the day was on dirt roads and paths between stone walls leading to the sea and the finish in Basksa. Stage 2. Insel Rab: Round the Island, Round the World. In the morning, our boat Harmonia, sailed from Baska to Lopar on the island of Rab. This is where Stage 2 would take place. The start was made by the ferry, which had brought the other riders to the start. And as we thought, we were already wet on the first few meters from the below, from the top and from the front. The final spurt was over the beach back to Lopar. As a result of the rain, the organizers sent us back to our accommodation right after the bike wash. It was pretty chilly when it was so full and busy! When Cony went to check and service her bike she realised the pads were worn out and she needed to change them. A simple job, but she hadn’t brought the right spares with her and I couldn’t be any help with a different brake and pad type. The search for new pads was on as the official service team couldn’t help either. I tried all my contacts and pulling in favours but no one could help. The wet and sandy ground had not only killed Cony’s pads but also done the same to a lot of the competition. We hadn’t found any spares up to bed time so had to leave it in the hands of the mechanics who promised the first pair that would fit. After all, we had donated Cony’s wrong pads and given them cake… what more could we do? 😳 Not a good situation to sleep on. Stage 3. Insel Cres: Merag to Osor. Early in the morning we sailed with the Harmonia from Lopar to Merag. The nice thing about being on the boat is that we were able to have breakfast while the boat sailed us to the start. In Merag we had to leave the Harmonia at 9:15, she had to make way for the ferry. So, 20 minutes before the start so the brake pads were changed and on time at 10.30 clock, we could start. Then a piece on the road followed before it again changed to gravel between stone walls to Ustrine and the second refreshment post! Fill up again and tackle the last km’s. Since they had to shorten the route because of the heavy rain, the finish came a 5km earlier than planned. The last few meters led through the narrow streets of the town Osor. Stage 4. Insel Mali Losinj: Still Single ….. after all these years…. .
We started in the piazza of Mali Losinj, then along the sea before turning into the first climb. It went up pretty rhythmically and then the first downhill, which was really steep and on very loose stones, not really what I love. 😛 I deliberately took some speed out, because I did not want to lose control of my bike and had we have enough lead in the bank to make it a bit more „comfortable“. Then followed a trail along the sea, which was really rocky and again and again there seemed to be a high cairn in front of us, we had to overcome. Fortunately, this year the start was staggered, so it was not as congested on the trail as last year. Continue on to Steinfelder, which was really exhausting to ride and required a lot of concentration, we finally came to this steep climb. On heavy tyres we rode up there. At the top we rode a short distance on the road before we turned into the next trail. This was also peppered with loose stone fields and smooth trails. It was cool and entertaining. At the foot of this downhill was finally the first refreshment post …. but we were not quite down, very cool !! Again, over a rough trail we descended to the sea! From now on it was only up and down along the coast, on trails through the forest, short and crisp climbs, many curves, changes in direction ….. until we rode from Vela Straza along the shore to the finish at Suncana Uvala ! We had to dig deep and earn the last kilometers because the wind came full from the front! Then suddenly 2km before the finish was expected, we had just crossed the finish line! Somewhat confused, we looked at each other! It was really fun and the trails and the landscape here are just amazingly cool ! !